Thank you to those of you who contributed to auroral science in 2015! We’re excited to share some highlights of what we all collectively saw last year in the skies based on when you reported “Yes, I saw aurora!” Thanks for reporting through our form on our website – the answers you submit to each question on that form help us learn important things about aurora. The form pops up after you click “Yes” to the question “Did you see the aurora?” in the ribbon on the dashboard of our website. On average, about 60% of people answered all the questions; take a look at how we use and learn from each question, below. What colors were reported most? A variety of colors were reported for aurora in 2015. Aurora color is based on the chemical make-up of the particles interacting and the amount of energy exchanged in the interaction at different altitudes. Different atoms interact with our atmosphere in different ways to emit different wavelengths of light, seen to us as different colors. We have an short infographic on our website, here. 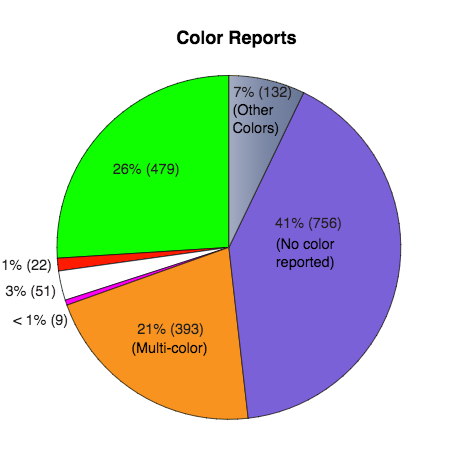 Although a little under half of the reports didn’t specify color, green was the mostly commonly reported color of all reports being seen 26% of the time, with multi-color aurora being reported 23% of the time. Green colored aurora are generally a result of electrons from the magnetosphere colliding with lower altitude oxygen atoms in our atmosphere. Higher altitude oxygen atoms create red aurora. Have you seen any green aurora with a pink lining on the bottom? Aurora with these colors indicate that it was very active. Many of our multi-colored reports included both green and red aurora. 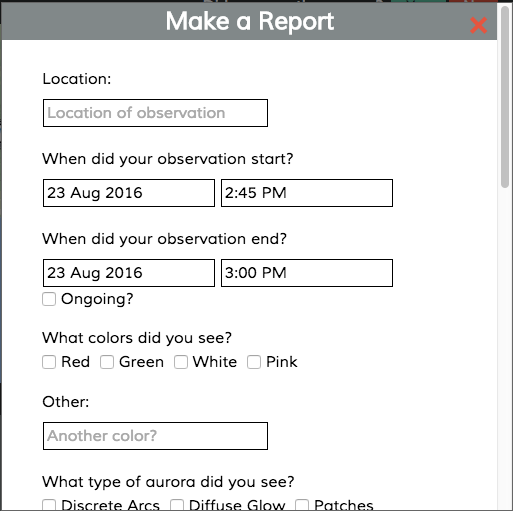 If you report aurora to us, make sure to specify the colors in your report so we can report back to you on how that fits in with all our reports. We received very little purely red aurora reports which makes sense because they are very rare! “Great Red Aurora” as they are sometimes called are rare not only because they come from very active aurora but also because they happen only under a specific type of geomagnetic storm. If you see red aurora, please let us know as it is visible from farther away than other kinds of aurora! How active was the aurora? About 47% of our reports indicated that the aurora we saw were pretty quiet. This also makes sense as aurora activity level is determined by how large the geomagnetic disturbances are in Earth’s magnetosphere; in 2015 we didn’t have a lot of very large disturbances over all the time in the year. 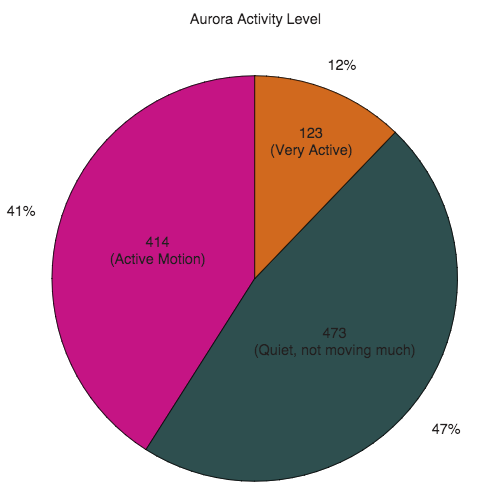 About 12% of our reports listed the aurora were very active with 41% reporting generally active aurora. Where in the sky was the aurora? Reporting the location in the sky you see aurora is particularly helpful; this kind of information helps scientists evaluate and update the aurora view lines. Of the reports that included the sky location of aurora, around a third were seen either at the northern horizon or at a roughly 45º angle looking up toward the North. A little over a tenth of all reports indicated aurora was seen directly overhead and about 7% of reports said aurora was seen in the whole sky (lucky folks!). Reports of overhead aurora help with work scientists are doing with aurora forecasting models. Model inputs come mostly from satellites which fly above us, in the ionosphere. Having supplementary observations on the ground allows for cleaner comparisons. It’s important to note that we are not reporting where aurora were in the sky in 2015 but instead, where our reports came from. This is called a geographic bias but we have ways to account for it in our scientific analysis. For instance, only 1% of aurora were reported to us from the Southern hemisphere in 2015. Not because only 1% of all aurora occurred in the South, but because we don’t have as many citizen scientists reporting aurora in that region of the world. We’d love to have more! What type of aurora did you see most? We also saw a variety of different types of aurora in 2015. We ask for three primary types; these three types are each driven by vastly different physics processes in the magnetosphere. Overall, there are many different types of aurora and the names for these types of aurora may change based where the aurora are being seen. People identify and talk about aurora in different ways based on regional and cultural differences. And, to add to the mix, citizen scientists can enter in their own descriptive terms for aurora type, too. We have more information on the common types of aurora (and some beautiful images and a gif!) on our website, here. The majority of reports identified the aurora they saw as aurora as diffuse glows at 39%. This is consistent with most of the aurora being seen as pretty quiet. 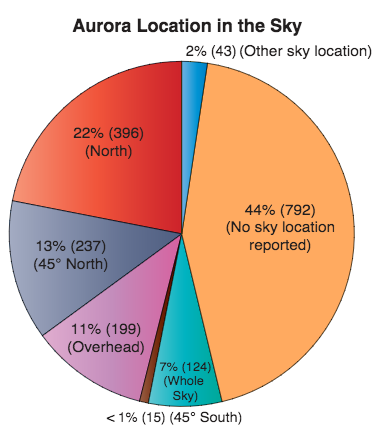 Close to that number, nearly 37% of citizen scientist reports show that they saw aurora as discrete arcs. A little under a quarter of all reports saw the aurora in patches and less than 2% identified aurora in other ways. The patches are usually seen after midnight, when people tend to be out less, and are less visually spectacular but very intricate and scientifically interesting. Learn more about different types of aurora on our blog with this post by Guest Blogger Allison Jaynes. We also saw registrations as users to the site grow nearly 12-fold in total number! We feel fortunate and excited to have so many new aurora enthusiasts onboard! Net growth by month during 2015 peaked around the Saint Patrick’s Day Storm in March of 2015 and toward the end of the year when the ample amount of darkness in the northern hemisphere makes for good aurora viewing opportunities. The best way to contribute observations is through the use of our form online, which covers many important questions and your answers (or qualitative metadata in technical terms) are very useful! Contributing your reports to the project allows us a greater scope of information from which we can all learn from, together. Written by Aaluk Edwardson, a science writer and outreach coordinator with the Aurorasaurus Project who also works in communications and outreach for the Heliophysics Division at the NASA HQ Office in Washington, D.C. Plots and analysis produced by Burcu Kosar, a postdoctoral researcher for the Aurorasaurus Project at the NASA Goddard Space Flight Center. This entry was posted in Analyzing Aurorasaurus Data, Studies by Aurorasaurus, Tweets. Bookmark the permalink. ← Space Weather at our Doorstep: How Can We Detect it?